Cando unha lambona vai de viaxe non pode evitar probar todos aqueles doces que son típicos. Cando fun a Praga xa investigara un chisco sobre lambonadas checas, mais non sempre é doado atopalas. Unha treboada desas que fai historia foi a causante de que esta torta de mel e máis eu tiveramos a sorte de coñecernos 😉 Non é unha sobremesa nin moi sinxela nin moi rápida de facer, mais paga ben a pena adicarlle un chisco de tempo. O máis complexo é o amasado, mais sempre hai algún truquiño que outro para non ter que complicarse de máis 😀 Imos aló! 1. Nun cazo, mesturamos os azucres, o mel e a manteiga e quentamos a lume moi baixo ata que a manteiga estea derretida. 2. Batemos os ovos e engadímolos, sen parar de remexer. 3. Seguimos quentando a mestura ata que vexamos que sae unha escumiña branca na parte superior. 4. E a continuación, engadimos o bicarbonato. Veremos que sae máis escuma e que aumenta o volume. Quentamos durante un minuto. 5. Sacamos a mestura do lume, deixamos que arrefríe un chisco e engadimos a fariña. Ao principio estará pegañenta, mais segundo vaia arrefriando, xa non se pegará. Deixamos que arrefríe. 6. Enfariñamos ben as mans e a masa e formamos un boliño. 7. Como a masa pesaba case 1 kilo, fixemos 8 boliños (esta torta de mel tradicionalmente leva 8 capas) de 120 gramos. 8. Agora ben o mellor 😀 Amasamos cada boliño sobre un papel vexetañ ata ter unha masa moi finiña e para facer capas de 24 cm de diámetro (se sobra masa mellor polos costados, mellor, despois darémoslle uso aos recortes). Ben, o mellor é aplanar o boliño e estiralo un pouco coas mans antes de poñerse a amasar. Se vedes que aínda así, resulta complexo, sempre podedes facer as capas de menos centímetros de diámetro. Picamos a masa cun garfo. 9. Enfornamos a 200ºC uns 2 minutos ou ata que cada capa estea douradiña. E así cos 8 boliños. 10. Cando saian do forno, collemos un molde, unha tapa ou calquera cousa que empreguemos como molde, poñémolo enriba da masa e cun coitelo imos cortando as beiras ata ter unha capa redonda. Faremos así coas 8 capas. 11. Os recortes que nos sobraron, poñémolos a torrar no forno durante uns minutos para que queden máis crocantes. Despois picámolos e usarémolos para cubrir a torta por fóra. 12. Agora que xa temos as capas, queda facer o recheo. Derretemos a manteiga e mesturámola co doce de leite. Se vos costa facelo cunha culler, podedes empregar a batedora eléctrica. E se queda líquido de máis, gardádea na neveira ata que espese. 13. Poñemos unha capa e botamos recheo. E así iremos facendo ata rematar. 14. Cando cheguemos á derradeira, só teremos que botar máis recheo e cubrir a torta por riba e polos laterais. 15. E cando xa estea ben molladiña, esparexemos os recortes picados. Para botalos polas beiras o mellor é axudarse dun coitelo, como se ve na imaxe. E listo! When a Little Miss Greedy like me goes on a trip, there’s always some time to try and taste typical sweet treats. When I went to Prague, I had already done some research on the net, but I do not always have the opportunity of trying all I want. 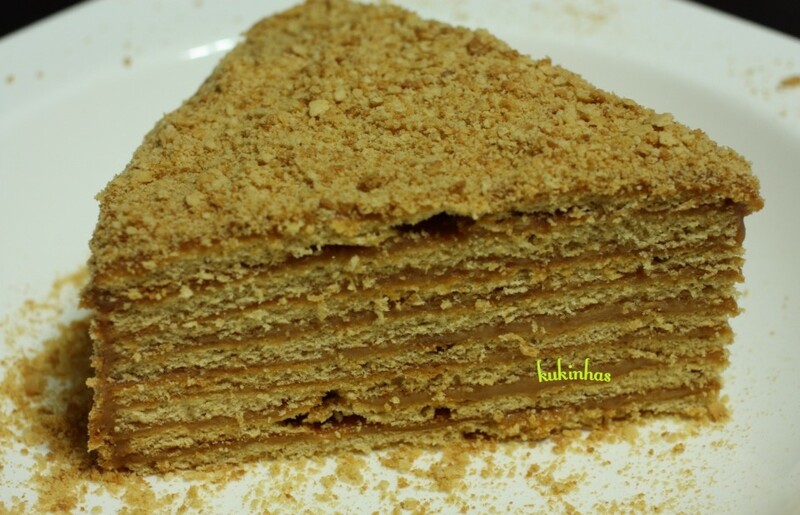 However, a huge storm (which is something typical in summer in Prague :D) at the perfect time and near the perfect place made me try this delicious honey cake. It’s not a quick recipe, and it will take soome time to prepare it. But…it will be totally worthy! I give you my word! So, don’t waste your time and preapre this absolutely flavourful cake and you’ll never regret it! 😀 The most complicated step is rolling the dough out, but I will give you some kukitips which will help. Let’s go! 1. 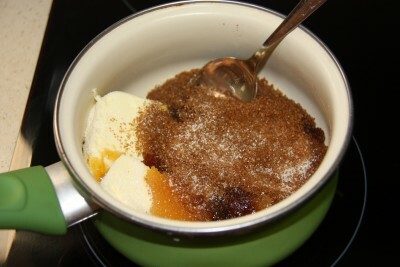 In a pot, mix sugars, honey and butter and heat all up at a low heat until butter is melted. 2. Beat eggs and add them while stirring all the time. 3. 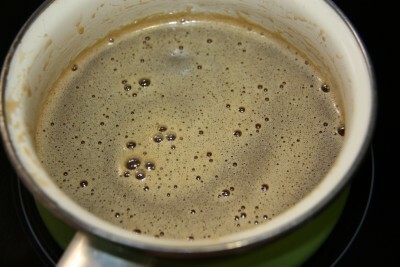 Continue to heat the mixture up until you see some white bubbles on top. 4. Then, add baking soda. 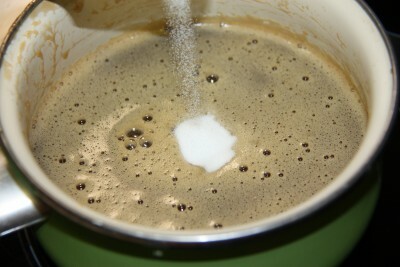 You will see even more bubbles appear and an increase in the volume of the mixture. Heat and stir for a minute. 5. Remove from heat, allow to cool for a while, add flour and knead. When warm, it will be a little bit sticky, but as it gets cooler, it will be perfect. Allow to cool completely. 6. Flour the dough, your hands and the surface and form a ball. 8. Time to roll out! Roll out each little ball over a baking sheet until it’s veeery thin and you can cut a round shape of 24 cm diameter (if it’s bigger, don’t worry, we will use cutouts as well). The easiest way of rolling this dough out is by stretching it a bit with your hands before starting, giviing it a round shape with your finger. If even then, you still have some troubles, you can try with less centimeters. Pinch with a fork. 9. Bake for around 2 minutes at 200ºC/400ºF or until golden brown. Repeat this step with all dough balls. 10. When done, take a mould, a dish or anything you can use to cut the round shape, place it on top and cut all the extra cake until you have a perfect round shape. We will do this with all the cake layers. 11. Take cutouts, put them over a baking sheet and bake them for some minutes until crunchier. Then, process them and keep for later. 12. Now that layers are ready, let’s prepare the filling. 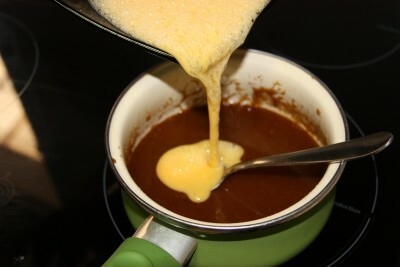 Melt butter and mix with dulce de leche. If it’s too difficult to mix, beat with an electric mixer. If it’s too liquid, keep it in the fridge for some minutes until thicker. 13.Place a layer, spread some filling, place another layer…until we use all layers. 14. When we get to the top, add more filling to cover the whole cake, even the edges. 15. And when covered with this yummy dulce de leche mixture, sprinkle with the cake crumble we’ve made. To cover the sides, use a knife as you can see in the picture. And that’s it!